DOTTIE . . . . upon arrival, and again a few months later. MIKEY grieving Mikey said farewell to his mate, Dottie, last Tuesday. 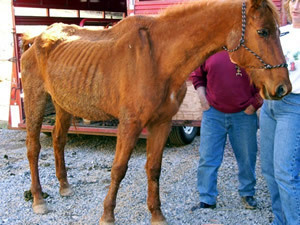 Dottie was starved and stricken with Pneumonia when rescued by STAR. 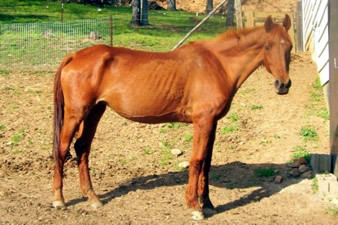 She lived the last 2 years breathing heavily, but finally enjoying life. When Dottie’s heart just gave out, Mikey would not leave her. Consoled by Karen, they wept together. Yes, horses cry. Mikey called for Dottie until late that night. 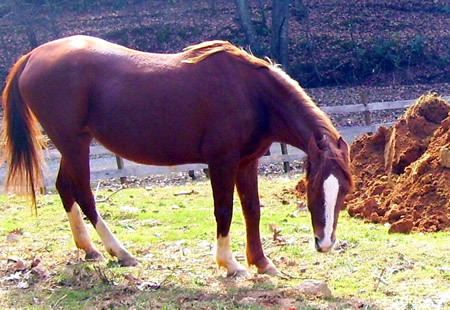 All the horses at the ranch stood still and looked in her direction when Dottie was buried in her pasture…they knew they had lost one of their own. There was not a sound…except Mikey’s breaking heart.